We are broke and penniless...well not completely penniless since my husband is still working and we get to pay the bills and eat. But that is all the pay can afford. There are so many bills that I try not to think too much on them, as I cannot afford to have an anxiety attack. Debt is not something I'd call on myself. Anyway, I think this year I want to follow this really cool chart I found on facebook. I might not be able to do every week, but I definitely will be trying this one on for size and sheer will! Let's hope soon, I'll have a job. Any job will do. I'll work hard. Now do you know if you begin NOW you can save up to $1400 in a year???? YES! Look at the chart below and do the math. What would you do with $1400? I don't know yet, but for some reason I can see groceries in there, and maybe a nice ham this year. Maybe even invite a family over for dinner! I've been wanting to do that for quite awhile now. So what do you want to save for: An unexpected emergency? household items? Gifts for the end of the year? or even a family vacation? Then step on it y'all and let's see how we roll! So what if you can't do it all each week. Just put something in. Even the couple quarters you took out your pocket in the evenings! PUT IT IN! So it's not that I want to be rich. I just want to be able to pay bills and buy a backpack for my son without wondering how it's going to kill the budget. This anxiety about getting by month to month is killer. Money woes is always a struggle for families with small children. I've been there, done that so I know how you feel. One thing that made a huge difference in helping us to reclaim the our sanity amidst the sea of bills was to consolidate our debts and in a 7-year period we were free of those obligations that just strangled the life out of us. Your plan looks like a clever one and easy to do. I like your song pick for today. It made me feel a little lighter hearted and caused me to boogie in my chair. I wanna be rich so I can help out my friends & family! Thanks for sharing Cathy. 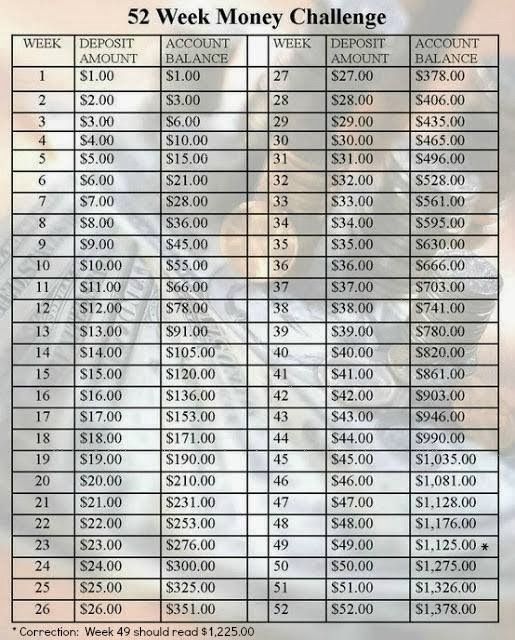 I want to do this for my kids this year and as for the debt, well there was no reason for it, except for the devil's foothold. Very appropriate song! And even $1400 would be RICH money for me! 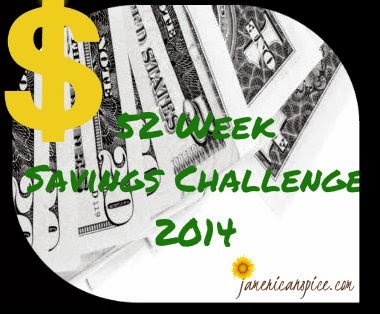 I showed the hubby that chart and he sked where I would find the money after the 5th week. Hahaha I know right! But whatever I'm keeping on. haha. Thank you Steve. I hope so too. Oh do I feel ya girl. Family of 5, one income. not easy to do at all. that's the price we pay for me to be at home with my children: essentials only -- don't even dream about the luxuries. We are very fortunate that my husband makes quite a good salary; but despite what people think: I do NOT get to stay home because we are rich. nay.nay. We sacrifice. I like this plan --- just put a little something away each week, no matter how small. It would be great to save up for Christmas next year because that is the most expensive time of the year; even though we don't go crazy on presents. Yes - appropriate song for sure. Not at all. We don't stay home because we are well off. Just the mechanics. Babysitters and so on would kill us. But things are a bit dire because of bad choices right now. I wish it wasn't so, but what a doozy and you have to keep on your feet. I might not be able to do every week, but even a dollar will do. I am doing the 52 challenge this year. In fact, we are doing double that. My hubby and I are both doing it. Sweet! You can do this. Keep positive and see yourself and all of the riches you have. That is great Naila! I wish you both wonderful fortitude and luck. I've Seen This A Few Times Great Idea If I Could Stick To It LOL! I Would Love To Get Away With The Family Maybe For A Weekend At SeaWorld! Oh Lisa, jump on it! Even if you get half way. Good luck and best wishes to you and your family for getting all you need. Some people feel rich in good health and I hope you enjoy this now. Thank you Neva. This is truth and I do feel very rich. WAs just speaking about this today. That's what I was thinking, but for me, even a dollar a week will work. There's no way I can do so many as the weeks get more and more. Oh yeah, and it's tax time and I have to figure that crap out too... oh my head already. Good luck to you with that too. At least you have two children to get you some money back for sure. Cute pick today too! Thanks Marie. The day I see a penny from the money that comes back from taxes, will be a shocking day. I know that song, catchy one too!! I thought for sure your son's backpack would turn up in the lost and found, big bummer that it didn't!! Oh he just ripped his backpack open. I guess getting a cheap one wont last as long. And kids are mad on materials. I found a good one. I asked him to appreciate it. Seems it's working great for him. Thanks. What a sweet librarian. I'm glad it worked out. We have a really nice one at our library too, I love seeing her face! Kindness is such water to the soul eh. My mom and I are doing this challenge together. I’ve seen the one where you start with $52, but this way is more doable for us. Way to go! I wish you complete success Catherine. I'm about to cry because I can't find my envelope with the 3 dollars in it. sigh. Well I already cried. Are you kidding me? That is a great find Colette! I should try the chart's saving method. It seems easy enough to carry out and look at the results. Thanks. I hope you do Amanda. This is would be great at year's end!